LifeClever has some insight about the new Adobe CS3 application icons in a recent post. I was shocked to find out that these icons were being considered final -- when I first installed a few of the CS3 beta programs months back I assumed they were put together by a developer who needed to distinguish between CS2 and the new beta apps. Certainly not an iconic design firm. But, alas, they are sticking around and it was a conscious decision. LifeClever is written by a designer with MetaDesign, the agency which does a good portion of the branding for Adobe. He provides a color wheel diagram showing where all of the apps fit in the color scheme, and he also states that the system is based off of a "periodic table." I wish he would talk more about the process involved, but I understand needing to remain neutral in this situation. I'll reserve judgment until the final release of CS3, because if the feedback I'm seeing around the 'net is heard by Adobe, I have a feeling Adobe and/or MetaDesign may make a change. Keith Peters (author of Making Things Move -- see sidebar) has a post today regarding Flex2 and Actionscript 3. His "rant" makes a great point about the differences between a Flex2 application and an Actionscript application. In short, you have to use the Flex framework to call your program a Flex application. If you code only in Actionscript 3, you've got a Flash application. Makes sense, but I agree with Keith that a lot of people are getting this confused. It confused me initially as well! Check out Keith's post (err rant) here. 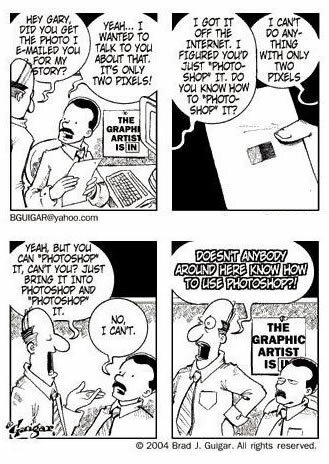 Just bring it into Photoshop and “Photoshop” it.